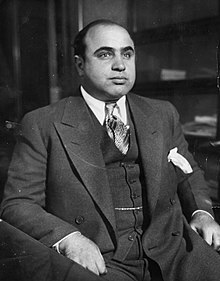 Alphonse Gabriel Capone (/ˈæl kəˈpoʊn/; Italian: [kaˈpone]; Januar 17, 1899 – Januar 25, 1947), whiles kent bi the nickname "Scarface", wis an American mobster, crime boss, an businessman that atteened notoriety in the Prohibeetion era as the co-foonder an boss o the Chicago Outfit. His seiven-year ring as crime boss endit whan he wis 33. ↑ "Mount Carmel". Oldghosthome.com. Archived frae the oreeginal on 2004-09-03. This page wis last eeditit on 12 Mey 2018, at 18:36.